In troubleshooting the issue, to rule out that the target import machine wasn’t the cuprit, we attempted also to import a Windows XP workstation with the same result. The standalone VMware converter utility was used also to rule out a problem with the integrated plugin in the vSphere client and the import failed. 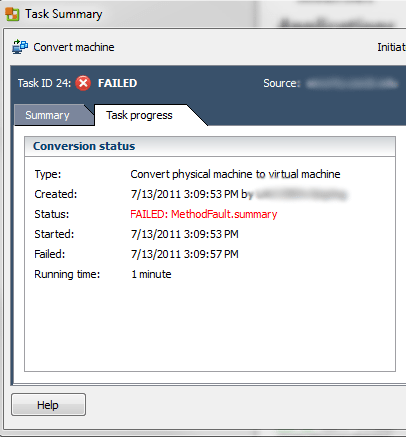 The converter logs really didn’t show anything definitive for the MethodFault.summary error. A quick search out on Google resulted in a hodge podge of semi-related errors but really nothing that seemed to fit in our case. The environment where the error was being seen was a well functioning environment where numerous imports have been performed and even a few machines pulled in recently. We decided to place a call to VMware on the error, however, in the meantime we thought that as in all Windows environments, to reboot the vCenter server to make sure this wasn’t a Windows problem. After rebooting the vCenter server, we WERE able to import the same server we had initially attempted to import. If you receive this error and nothing else in your environment makes sense as the culprit, a reboot of your vCenter server just may do the trick.